Iraqi forces claim to have captured a portion of Nimrud – a site of historical renown destroyed by ISIS – as a part of their advancement into Mosul. Nimrud, according to the World Monuments Fund, was one of the two sites with the preserved remains of Assyrian palaces of the first millennium BC. ISIS apparently destroyed whatever remained in Nimrud on the basis that the site was un-Islamic. 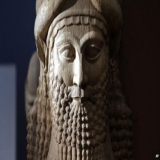 What is the latest news from Nimrud? In their strategy to push ISIS from Mosul’s south onwards, Iraqi soldiers have reportedly recaptured two villages at the periphery of Nimrud, a city of historical significance. 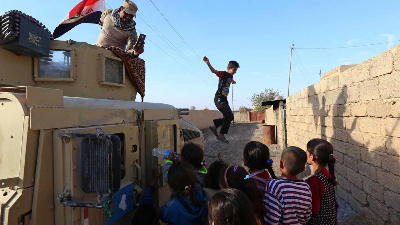 While it was earlier thought that the whole of Nimrud had been recaptured, military officials told Al Jazeera that the villages of Nimrud and Numaniyah were wrenched from ISIS’s grip by the ninth division of the Iraqi Army on Sunday. It has been four weeks since Iraqi military forces began the battle for Mosul – the biggest city under ISIS’s control.While Iraqi forces have almost encompassed Mosul, ISIS’s defences have until now been ruptured only to the east, where the battle between ISIS defendants and elite troops of Iraq’s Golden Division has been over about a dozen districts. Iraq’s Government says ISIS will meet its end in Iraq with the resurrection of Mosul but adds the fight will be arduous, long and painful. An army Special Forces officer on the northern frontline said Hadba, the closest neighborhood within city limits from where he and his team were positioned, is expected to be the next target. Bawiza, the village from which the attack is planned is said to have been recaptured from ISIS, as has Sadaa. The ratio of Iraqi forces to ISIS defendants is 10 to 1 – the largest Iraqi force since 2003. In some areas, ISIS has made use of tunnels and civilian shields to enable their members to retaliate in the night. As a result, the gains of the previous day are canceled and control is transferred to and fro three to four times. Booby-trap bridges are believed to be a part of the defence strategy as are suicide car bombs, roadside bombs, snipers and long range mortars. They have attempted to distract Iraqi troops by attacking outside of Mosul. In one such attack, ISIS captured the town of Rutba – a strategic route that connects Baghdad to Jordan and Syria – on October 24. Iraqi Government later said that their troops had defeated ISIS. More than 54,000 civilians have been driven from their homes so far. The Norwegian Council estimated that ultimately 700,000 people would be deprived of basic amenities.The United Nations says the devastation brought about by this battle might be one of the largest humanitarian crises in history. Rights groups have alleged that Iraqi government forces tortured and murdered civilians suspected of affiliation to jihadist groups south of Mosul. The allegations were met with denial even as Amnesty, in its first such report detailed several murders following torture of separate groups of men. The report added that if not held accountable, the government forces were likely to repeat the alleged abuses as they continued the Mosul offensive. Why is Nimrud an indispensable part of world heritage? What was Northern Iraq like around three millenniums ago Treasures dug out by archaeologists – starting from the early nineteenth century – provided clues of a grand past as Nimrud emerged from below.It was internationally recognized that Nimrud was an Assyrian heritage to be treasured. Archaeologists discovered portions of royal palaces, single statues and smaller artefacts among the components that characterized the city. 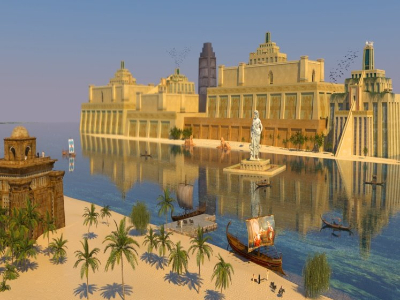 The city also housed temples dedicated to Ninurta, the god of war, and of Nabu, the god of writing. It is said to have been a major Assyrian city for about seven hundred and forty years and the capital of Assyria for approximately 150 years.Several scholars consider Nimrud to be the capital of the world’s first true empire, the Neo-Assyrian Empire of the 1st millennium BC. The palaces of Assurnasirpal II – who established the royal headquarters at Nimrud and made it the military capital – are tokens of the political, cultural and artistic glories attained by the Assyrian empire during that time. When were key excavations conducted? British explorer Austen Henry Layard conducted the first excavation in the 1840s. 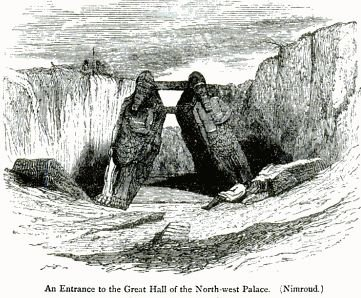 He unearthed the North-West Palace (Palace of Ashurnasirpal) and also the winged bull gatekeeper statues which are now housed in the British museum. He also discovered finely carved facets of the king’s life in the interior of the palace. Max Mallowan, famed crime writer Agatha Christie’s husband, carried out extended excavations in the 1950s-60s.Hundreds of relief sculptures, wall paintings, ivory furniture, stone jars and metalwork were recovered by him. He and his team also reconstructed the intricate plans of the palace, temples and fortress. A detailed description of the construction of the palace and the surrounding landscape in Assyrian cuneiform (an ancient writing system) was also found on a free-standing slab. Statues of monarchs and an obelisk (enormous stone pillar that tapers upwards) dedicated to Shalmaneser III. 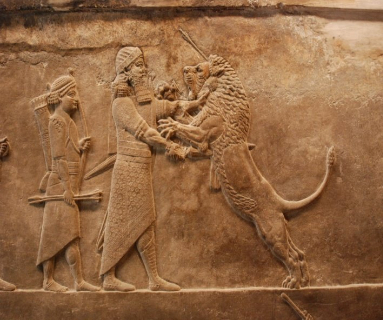 Assyrian lion weights that carried bilingual inscriptions and at the time of discovery revealed the oldest Phoenician-style inscription discovered until then. Note: The winged bulls – comprising of a human head, bull’s body and eagle wings – a symbol of the Assyrian empire are said to combine the faculties of wisdom represented by the human head, physical prowess in the form of a bull’s body and the capacity to fly high and recognize and forestall evil represented by the wings of an eagle. The technical expertise and artistic finesse displayed by the artisans are said to be unparalleled in the ancient world. When one is made aware of the vastness of Assyrian conquests recorded in relief sculpture (sculpture in which the sculpted figures appear to jut out from the background plane). Those involved in the sculpting process paid enormous attention to details of the place and culture that formed their source.This made their sculpture realistic. When Nimrud’s potential was understood and restoration began during the 1970s and 80s. This phase led to the stunning discovery of richly packed tombs that had been constructed for the Assyrian queens. Placed within the tombs were jewels, crowns and bowls made of gold, ivory and enamel. When – it seems long ago when viewed from the current context of a decimated place – during restoration, Nimrud was a favorite visiting place for families and students from surrounding schools. It provided a thoroughly enjoyable and educational experience which was sadly cut off. When despite the ardent desire to view these masterpieces in their original setting, one is forced to be thankful that at least parts of them survive because they were transported to different places across the world or are being digitally reconstructed. 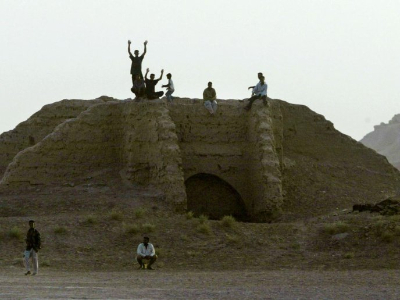 Where else are some of the ISIS-ravaged monumental sites? Nineveh was another treasure from the period of Assyrian king Sennacherib (704-681 B.C.). 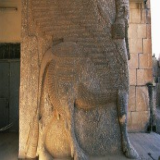 Nineveh, like Nimrud, revealed royal palaces – the palace of Sennacherib had 71 rooms, the library of Ashurbanipal and sculpture that reflected the life and times of the people of that era. World Monuments Fund, an organization that aims to conserve the world’s most treasured palaces listed Nineveh and Nimrud in its watch list. Palmyra is an ancient city in Syria that came under control of several empires and greatly prospered during the reign of the Roman Empire. The city’s artists and architects used the Greco-Roman style while retaining local elements; the Temple of Bel was a shining example. Other monumental works included the Great Colonnade and the characteristic tower tombs. Who were the Assyrians of the Neo-Assyrian Empire? Many historians argue that the Neo-Assyrian Empire was the world’s first true empire. Nation building was a key characteristic of this empire and as a result the inhabitants of all newly conquered provinces were made to assume the Assyrian identity.Though it was considered a unified whole by its emperors, ethnic diversity prevailed within the empire. While henotheistic (acceptance of other religious deities while placing one god as the central deity), the Assyrian identity increasingly spread over time. Policies of mass deportations introduced by Ashurnasirpal II and taken up with increased vigor by his successors led to social, linguistic and cultural changes. Aramaic became an official language of the empire, in addition to the Akkadian language. The Assyrian law code established during this period mandated free male citizens to volunteer in the army for a time. The common cultural practices across the Empire included the imposition of taxation and military service, a uniform calendar, judiciary, and conscription system, as well as imperial weights, measures, and other standards. In addition, imperial art, cults and religious festivals were used to perpetrate the Assyrian influence. It goes without saying that this Empire was built on brutal conquests, plundering of sacred and religious treasures, destroying cult centers and replacing them with Assyrian cult centers and at the least, a subjugation of other cultural and religious practices. The Assyrians were well-known for their expertise in warfare. The Neo-Assyrian kings have a long-standing reputation of macabre repression against those who revolted, and, as historian Kriwaczek puts it, for their sheer murderous savagery. Given the immense destruction and that these kings brought about to establish their own name and the Assyrian identity, one likely inference from the current destructions of their heritages is that history repeats itself. The justification of this inference is beyond the scope of this knapp. 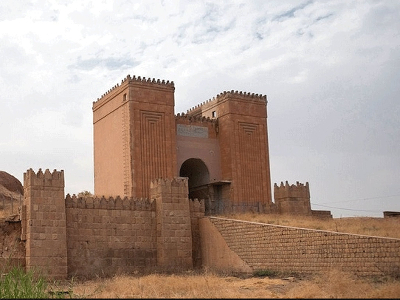 How has ISIS systematically wrecked the heritages? ISIS claimed that the monuments and several other artifacts were un-Islamic and would therefore be eradicated. 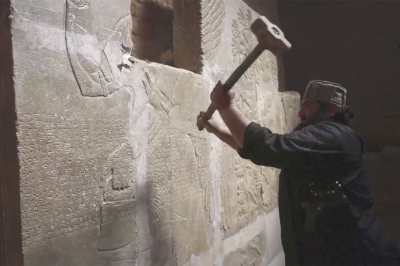 Starting 2015, they destroyed Akkadian monuments in the Mosul Museum, and then announced that they had bulldozed Nimrud and the archaeological site it belonged to as the construction had been a blasphemy, as ISIS termed it.One destroyer filmed the catastrophe and proclaimed that the members of ISIS were executing the Prophet’s orders by destroying the relics. Another video apparently showed the militants using hammers, bulldozers and explosives to destroy parts of Nimrud. They extended their acts of demolition to Hatra, another ancient city by calling the artifacts “un-Islamic”, “inducers of polytheism” and claiming that the graven images should not be allowed to exist, despite the fact that various Islamic regimes had preserved the site for 1,400 years. The tearing down of artifacts was filmed and shared. ISIS went from indifference to blatant destruction in its conquest of the Palmyra. The initial statement was that while polytheistic statues would be taken down, the World Heritage of the city would be spared. But when the savage destruction period ended, even buildings with no religious significance – such as the Arch of Triumph – were brought down. Even in retreat, the ISIS militants managed to severely damage parts of the Palmyra Castle.